This is one of the ways the city has begun to use gardens. The large antique-look clock and antique-look street lamps are between a triangluar garden of yellow day lillies and low evergreen shrubs. 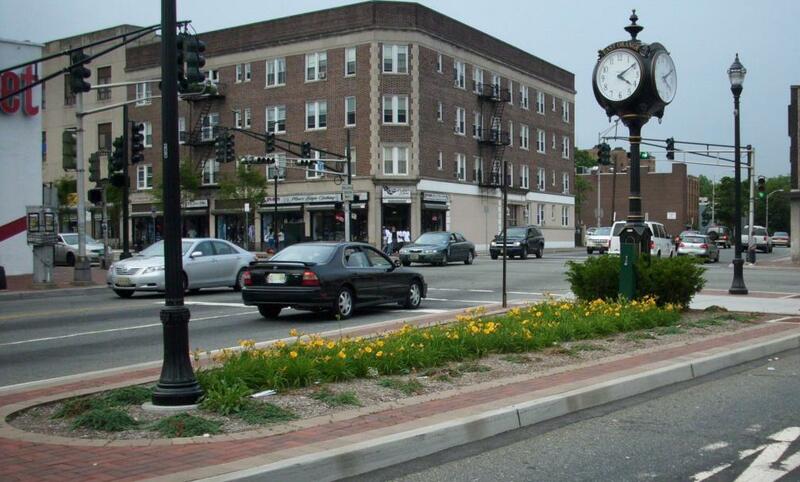 This is a low maintenance perennial garden that could easily be applied all along Central Avenue. I hope they continue what they started. This photo was taken in early summer of 2010 just after the clock began working. 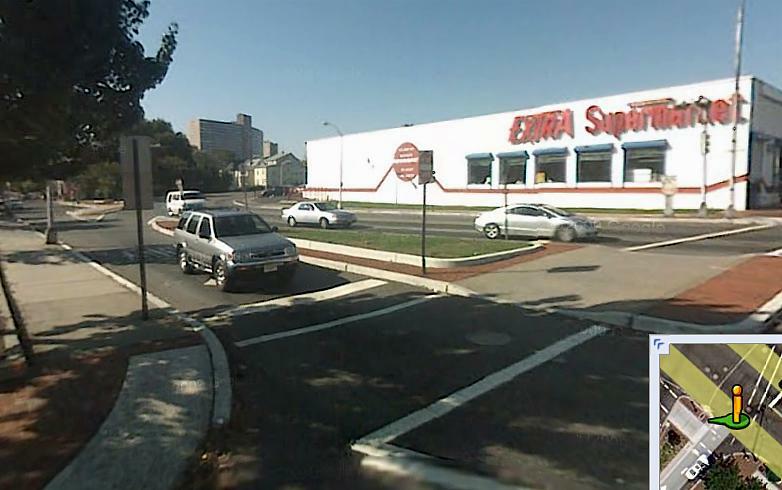 I captured this photo from Google Maps as a record of the way the median appeared early in 2010. The Clock was added in the Spring and started telling time in the early summer. In early November, of 2010, I lost my car and decided to give up driving. Since I could not make the long walk over to the Senior Garden at City Hall Plaza any more, I looked for a project closer to home that I could walk to each day. The Clock Garden is an ideal project for me as I get older, since it only needs a cleaning of city debris a couple of times a week. As the picture shows, it survived the summer without needing daily watering so I should be able to take on this project for a while. The location is used by street vendors selling newspapers and "stuff" to passing cars, so there are lots of cigarette butts and plastic cigar holders, as well as a good collection of liquor bottles hidden in the bushes, and lots of debris from Dunkin' Donuts which is just down the street. The sad part is that this corner is well covered with city trash bins, including special bins for waste and for recycling, yet the sweet people of East Orange prefer to drop their trash on the ground in front of the bins, rather than into the bins. Those who want to turn our city into a slum may get their wish one day, but this spot they may not have as long as I am still able to fight the blight. In the fall of 2012, the city began planting Chrysanthemums (commonly called just "Mums") in various locations around the city. I got to enjoy the ones near my house, including the Clock Garden and the medians along this part of Central Avenue. This median is looking towards the west from the corner of Evergreen Place and Central Avenue. There used to be wrought iron fences surrounding the medians in the center of the street, but that was a disaster waiting to happen, as I showed on the day before Earth Day in 2010. This is the view looking east on Central Avenue. The cross street is Evergreen Place. The sidewalk displays center around trees, and those still have the wrought iron fences because they are up where the cars can't easily run into them. Everyone I spoke to seemed to enjoy having the flowers along Central Avenue in the fall. I hope so. They paid for them with their tax money. If the City has planned this correctly, the Mums can be used again next year because they are perennial, but they have to be cared for over the winter. Many gardeners just toss them out and buy new ones next summer in time for the fall planting. That's fine if you are paying for plants for your own garden, but these are paid for using other people's money. Let's see what the City does in the Fall of 2013.